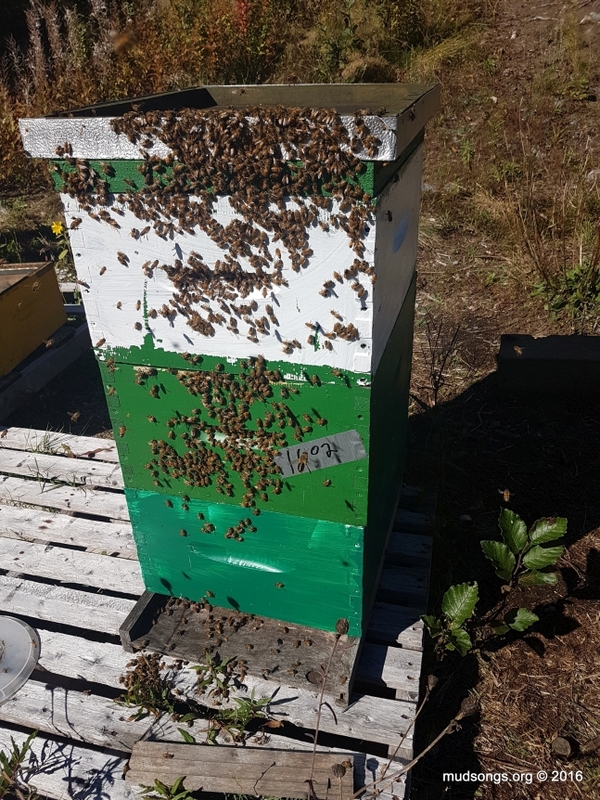 I bought three nucs from the Newfoundland Bee Company in mid-July and today, two and a half months later, each of the subsequent hives are overflowing with bees. Here’s a not-so-great photo I snapped during a marathon beekeeping session that shows what I found in one of them when I opened it today. I even found two frames of capped brood in the top deep of this hive. I’ve never had nuc-hives so full of bees at this time of year before. I have to applaud the Newfoundland Bee Company. The queens that came with their nucs are incredible. I probably could have gotten a honey harvest from these hives if I had thought to super them up. My only concern is that there are too many bees in the hive and they’ll eat through their winter honey stores too fast. I know the cluster will reduce in size by the time November rolls around, but at the moment it would be one seriously gigantic cluster. I added a third deep and a hive top feeder to the hive two weeks ago because there were just so many bees in the hive, a hive that was already filling fast with honey, that I had to give them something else to do. The third deep was a mix of bare foundation and drawn comb. They filled the drawn comb but didn’t do much with the bare foundation. I suspect the bees are more in a nectar-storing mode than a comb-building mode at this time of year. At any rate, I put an escape board under the deep four days ago with the intention of reducing the hive back to two deeps. I knew there were a lot of bees in the hive, but I didn’t realize it was this much. That’s the escape board on the ground carpeted with bees. I left it there and let them gradually walk back into the hive. Even with a top deep nearly full of honey (except for two frames of capped brood), is there enough honey in this hive for such a large number of bees? I don’t know. I’ve never experienced this before. Perhaps it’s the perfect balance of bees to honey. Perhaps it a disaster in the making. I’m out of my league on this one. All three of the nuc-colonies I got from the Newfoundland Bee Company are in this condition. It’s incredible and slightly unnerving at the same time. 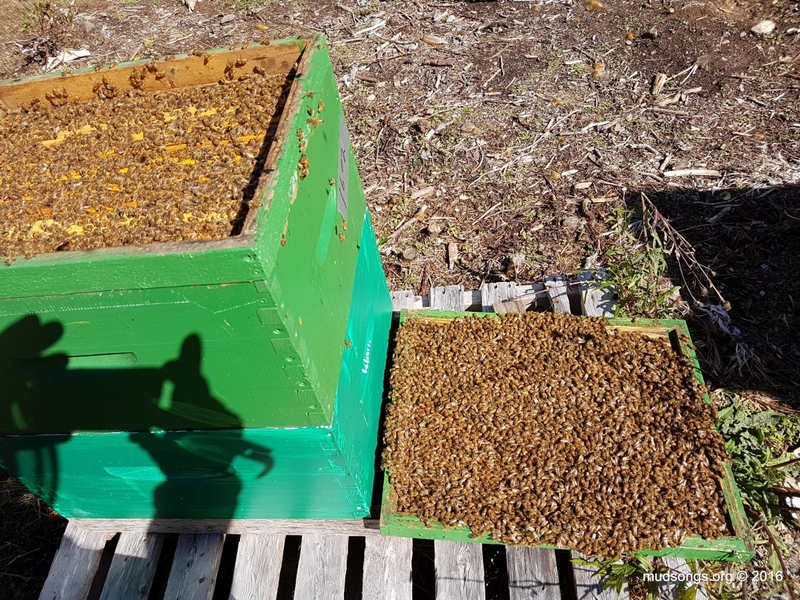 For the record, I built up the nucs on drawn comb with an extra frame or two of brood from my other colonies and fed them sugar syrup mostly through frame feeders until there were enough bees to forage on their own in late August. Pretty much my standard procedure for building up nucs. Nothing special. Other than fantastic genetics in the queens, I can’t explain it. UPDATE (the next day): I have some theories on why the hive is so full of bees, other than good genetics. One reason could be the dry summer. Not much nectar but a lot of pollen coming in, pollen that helped boost brood production. Even my older colonies with older queens have more bees than I expected. I’ve never been concerned about late-season swarming before, but I am now. I decided to play it safe and put a third deep on this hive. I took peek under the top cover and the bees came boiling over, thousand of them holding on to the top cover. I don’t care what time of year it is (except the winter), whenever I see that many bees in a hive again, I’m adding a super to give them more room, either a brood box or a honey super, but something. This entry was posted in Behaviour, Brood, Brood Nest / Cluster, Escape Boards, Feeding, Hive Top Feeders, Month of September, Nucs, Queens, Sugar Syrup, Year 2016. Bookmark the permalink. Wow – thats an impressive number of bees! What a sight! They’ll have a great head start going into winter. I’m sure they have a ton of honey stored away, but as a precaution will you stock them up with sugar cakes when the weather finally turns cold? Also, with so many hives and Italian bees, do have a problem with robbing? I also got my nucs from The Newfoundland Bee Company. The bees are so docile, even at this time of the year. One of my nucs is doing really well. Very active, lots of bees still bringing in pollen and taking down lots of sugar syrup. My other nuc, which was very strong, seems to have slowed down since our cold spell last week. There’s very little traffic, they stopped taking down syrup (I switched out the frame feeder for the German rapid feeder and they stopped taking it down- so I’m switching back tomorrow) Their numbers seems to have dwindled. I was convinced the queen was dead so I reluctantly opened up the hive and luckily I found her in the brood box. I didn’t continue the inspection to look for eggs or brood because I’ve had lots of robbing on the go recently and didn’t want to keep the hive open for any length of time. To deal with the robbing, I reduced entrances and made robber screens and that really helped. Always an adventure! Sorry for the late reply. Out of town for awhile. I saw robbing for the first time this year. I triggered it twice. The first time by adding concentrated anise oil to some syrup, the second time by inadvertently leaving some honey outside. Reducing the entrances curbed it. I didn’t know about robbing screens until this year. A clever concept, though I heard from someone who said they didn’t work when he had extreme robbing (in a different climate, one with nectar dearths on August). I’ve never had a problem with robbing until now. My bees are a mix of Italian and Russian, for the most part. The darker ones with more Russian genetics are the most sensitive to temperature and will shut down quickly as it gets cold. So how a colony is doing at this time of year often has more to do with genetics than anything else. I plan to put sugar cakes above the top bars in November after the bees cluster down below just to be safe.